London Jazz News : You trained as a classical pianist so what motivated you to move into jazz? Nathalie Loriers : I was playing some classical music and on the last page of a piece, I saw there were some bars of Duke Ellington - this was my first contact with jazz harmonies. The harmonic world of jazz immediately attracted me. When I was 16 I went to a concert with Steve Houben and string ensemble, and I was very touched by this. So when I went to the Brussels Conservatoire, I did some jazz classes, and learned to improvise. Jazz was more connected to my personality - in classical music you are often very alone and I like the opportunity to play directly with other people. LJN : How would you describe your music? NL : My music is melodic, rhythmical, lyrical. Harmony is very important to me. I like to escape - I like to find freedom in my music when I write and even when I play standards. My music comes from my emotions of course. LJN : You say of course, but there is a theory that some contemporary music comes from the head and less from the heart. NL : For me it's the main reason to make music. Jazz is very difficult music intellectually even though it's easy to learn and play but I fell in love with it. When I listen to music I love I get a palpable feeling inside me. I want to reach that same emotion when I play and I want to communicate this to the audience. Of course there is a lot of work behind this, where you use your intellectual machine but at some point it becomes organic and free, and this is the total freedom I am looking for. LJN : What motivates you to compose? NL : Composition and improvising are the same to me - the meaning is the same - it must touch my heart. When I listen to any kind of contemporary music I might say "Oh these guys are playing well and I am full of respect" but I am searching for the thing that will reach my heart, and this is rare. LJN : One of your very early recordings, in 1993, was with Lee Konitz. How did this come about? NL : I was very young and I had the opportunity to meet him again 15 years later with the Brussels Jazz Orchestra. A journalist suggested we play together - of course I was afraid but I learned a lot and today I still think about it - he told a fellow musician that he liked my playing and he was happy to play with me again 15 years later. I think it would be nice now to redo that recording, now I have more experience and I would approach the music differently. LJN : Your trio (with Tineke Postma on saxophone and Philippe Aerts on bass) is an unusual combination. What is about this combination that inspires you? NL : It's the sound of it. I like playing with drums of course. But without drums there is space. I hear myself very well. Rhythmically we can build the groove together, we are not sitting on a drummer. The sound is fresh. In some ways it is more difficult to play without drums but the audience tells me they hear everything. For example, sometimes the lower register on the piano cannot be heard over the drums, but without drums you can hear everything. The music is delicate. You have to be prudent and at the same time let it go. 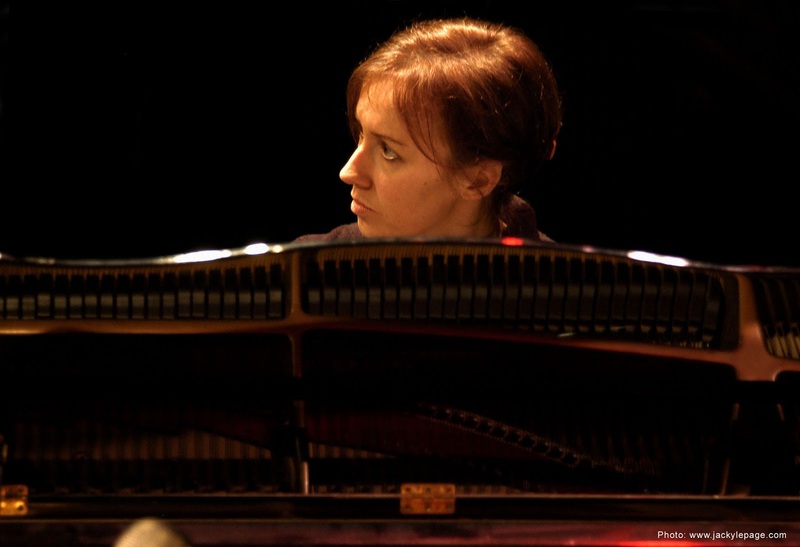 LJN : When you played at Gaume Jazz Festival in 2013 was that the first time you had played with Tineke Postma? NL : Yes. It was the first time we had met. The Festival Director Jean-Pierre Bissot told me it would be broadcast on the radio and I asked for it not to be broadcast if I was not happy with it. But as it turned out, it was magical. I listened and it was nice and the CD Le Peuple Des Silencieux was the outcome - it was a real jazz experience - it just happened. LJN : One of your albums is "Silent Spring" and your latest "Le Peuple des Silencieux" also contains the word silent or silence. This cannot be a coincidence. What is going on? NL : Silence is important for a musician. The titles of these albums is about the natural world. My latest, The Silent People, is about all living beings (animals, flowers) who cannot speak, who say "Stop what you are doing to us". It is an ecological statement. And it is about people too, who are silent - people cannot say anything about what has happened recently - things are decided by people with money - but everyone can see what is happening. LJN : You mentioned practice as a form of meditation - what do you mean by that? NL : I try to meditate - I did some yoga a few years ago. At first I was sceptical that it would work, but then I found it interesting. Now I find that as I practise every day I reach a state of non-ego - when I am out of myself - I am concentrating deeply, time is not there anymore and it makes me very loose. I can reach this state whenever I play or perform. Of course the brain is working, the control tower, but it's like a button in my head I can let go, and it just happens - and I don't know what happens - my hands are playing and I think "What is that?" Sometimes the playing is not good but I like this feeling and I like to explore it more and more. LJN : What are you listening to? NL : On the way here I listened to Herbie Hancock Live in New York. It's so free and crazy. He is giving his band freedom. I try to do this. I have heroes who influence my playing - not in the choice of the notes - but just inside myself- it's my homage to them. LJN : Who are your heroes? NL : Some pianists do not touch my heart, they are so technical. But Bill Evans does, as does Keith Jarrett, Bobo Stenson, John Taylor, Chick Corea. I am connected to this generation. I don't listen so much to the newer generation - of course I listen to know what's going on - but I go back to the past to learn and to inform my teaching. LJN : One album to take to a desert island? NL : Bill Evans, Never Let Me Go from Alone. It makes me cry. And I like to make people cry through my music. Maybe tomorrow I will choose a happier song!